We had a good turnout for our September 17th meeting. A grand total of 10 members (including 3 newcomers--Loan, Bruce R. and Vikram, who was visiting from Seattle) showed up and a good time was had by all. Our next meeting will be held on Thursday October 15th at 6:30pm, at the usual place--Perks pen store by Oakridge Mall. Topic/theme: TBA. Many thanks to everyone who attended the first VPC meeting of the season last Thursday, and to our host Richard Clarke, who generously donated a Cross inkwell set for our door prize draw (which was won by Vikram!). (Photo taken by Richard--From L-R: Ryan, Loan, Ian (back to camera), Michael, Maja, Vikram). Not pictured: Bruce, Brian, Graham, Richard. It was so good to see everyone again and what wonderful new folks that came along, hope you can make it again. Vikram, I am in awe of your penmanship sir! Hey, is anyone else planning on hitting the Seattle Pen Club meeting in Bellingham on the morning of October 17th? I think I'm going to check it out, as I enjoyed their meeting in Lake Forest Place in September. I'm not 100% sure about the details of place and time. Hi Graham, I'm hoping to attend that meeting of the Seattle Pen Club in Bellingham on the 17th (it's the weekend after our Thanksgiving, so hopefully crossing the border won't be as much a hassle as on the previous weekend). 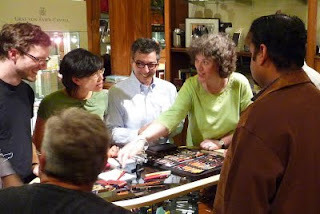 The Seattle Pen Club is a great bunch and I look forward to seeing them again. Count me in! I will post some info about the meeting once I get all the details. Usually the Bellingham meetings are held at the Bellingham Public Market at around 11am. Update on the location for the Seattle Pen Club's meeting in Bellingham on Saturday Oct.17th----According to George L. of the SPC, the meeting will be held at the Bellingham Public Market at 1530 Cornwall Avenue. Start time is tentatively set for 10:00am (but no earlier), and the meetings usually go until 1:00pm or so (3 hours in duration).